Fun, Approachable Yoga Workouts You Can Do Anywhere (On Your Own Schedule). Hey, it’s Steve – I’m the goofball in the above video that just walked you through the inside of Nerd Fitness Yoga. I’m so freakin’ excited that after a year planning, developing, filming, and producing these sessions, we can finally share them with you today! Yoga has been proven again and again to be one of the best ways to get healthy, build strength, improve flexibility, and lose weight when paired with a healthy diet. It’s fantastic for all body types and experience levels, due to minimal joint impact and ease of scaling for many poses. And it just so happens to be the perfect compliment to our normal strength, bodyweight, and barbell workouts. But very few people actually went out and got started with yoga! We started to poke deeper. Why is this? Why do we all know this is such a great tool in leveling up our lives, but only a few of us actually adopt a regular practice? Problem 1 – Finding a yoga studio can be intimidating. Sitting down to research yoga studios, especially when you are new to yoga or new to an area, is an incredibly frustrating process. You have to compare prices, locations, scheduling, instructors, personality, culture, availability, etc. Some areas have very few options at all, while others have over a dozen studios in their city. Problem 2 – Yoga can be expensive. Regularly attending in-person yoga sessions can also get pretty pricey. There’s a great amount of value if you find the right studio, but you are expecting to shell out at least $10-$20 (or more in major cities) for each session you attend. Locking yourself into a lengthy contract will still cost you often over $100 a month in many cases. Even other online options regularly charge $10-$50 per month for membership. That’s hundreds of dollars a year just to get started! Problem 3 – Yoga can require a huge time investment. The typical in-person yoga sessions, even for beginners, can last between 60 and 90 minutes at most studios. Once you factor in packing clothes, commuting through traffic, parking, commuting back home, and showering – whew, you’ve just invested several hours of time. Most of us know we need to prioritize our health and fitness, but need a commitment less than 3 hours to get started! Problem 4 – Yoga doesn’t allow much flexibility (pun intended). We’re talking about flexibility of schedule here. All studios have to maintain a schedule, which means you are at the mercy of however they program in their time slots and classes. Just starting out and want to go on your lunch break on Wednesdays? You’ve gotta search for a studio that has beginner’s classes at the exact time you need. More experienced and looking to push yourself? Same issue, gotta find the right schedule that offers an advanced class at the time you want. Ever tried to coordinate yoga sessions while traveling? Forget about it. Problem 5 – What if the poses are too hard (or too easy)? Time and time again, we heard that new people who try yoga are most confused about how to scale poses to make them easier. They’re afraid either they won’t be able to keep up – or on the flip side – the routine will be too easy for them and a waste of time. A great yoga instructor will be able to help you adjust some of the moves for your body, but with dozens of students in each class, you can’t always expect personal attention. One of the biggest killers of momentum is coming up on a series of poses you can’t do, not having any idea how to adjust, and then falling behind. Once we noticed that the 5 core problems above were almost universal for people who were trying to build the habit of yoga, we sat down to decide if we could build a yoga program that solved each of these. Made each session approachable and fun, instead of a intimidating and awkward. You can do anywhere – in your own home, in your office, at a park, on top of a mountain, or in your underground secret lair. Allowed you stream or download each workout to or from any device – just click play and go. Worked around YOUR schedule – accessible any time, day or night, 365 days a year. Required as little as 25 minutes per session, with even the most advanced sessions being under 45 minutes of total commitment. Took the guess work out of how to figure out a pose and showed exactly how to scale every pose (either up or down) next to each workout. Featured level-based workouts that keep pushing you as you get better. Beginner, Intermediate, and Advanced sessions allow any experience level to get started right away. Allowed you to tap into the encouragement and accountability of a powerful, worldwide community of like-minded people, without stepping foot in a studio. Was completely available for an affordable, one-time payment. No contracts, no monthly payments, no per session fees. 7 Unique Full Yoga Workouts (25 – 41 minutes in length) ← These are our core yoga workouts. There are 2 beginner, 2 intermediate, 2 advanced, and one slower paced, all level video. 5 Daily Mini-Sessions (5-10 minutes in length) ← These focus on specific areas where you might be tighter or need more work and can be done whenever you have a spare 5 minutes. Full Pose Archive ← Featuring over 140 poses that show you exactly how to scale each up or down to your personal fitness level and body type. Bonus “Getting Starting” Video ← This will show you exactly what you need, what to expect, and common poses that will come up again and again. Jump into a fun, welcoming, and REAL atmosphere. Practicing yoga shouldn’t be intimidating. Quite the opposite – yoga should be FUN, welcoming, and down to earth. That’s why we partnered with our amazing friend, Kate Marolt, to be the lead instructor for all our workouts and sessions. Kate’s a trained instructor who has taught for 4.5 years in various locations around the world at international yoga retreats. She’s had over 1,000 hours of combined training in various styles of yoga. Most importantly, she believes that yoga should be accessible and open to everyone, and she shares the same nerdiness with the rest of the team (plus she laughs at our jokes!). Following along to each core workout with Kate, you’ll have Steve (Nerd Fitness Founder and Leader of the Rebellion) and Staci (Rebel Operations and Powerlifting Badass). They weren’t about to let you have all the fun without them! Click play, get started with yoga, and get on with your day! Everyone is freakin’ busy. On our journey to level up our lives, we have a full schedule and a lot we want to accomplish. Working out needs to be a priority, but it also needs to be convenient for different situations and ever-changing schedules.Our daily mini-sessions allow you to squeeze in mobility and flexibility workouts in as little a 5-10 minutes. These are designed to be done multiple times a week in areas you are looking to improve. They’re perfect for mornings, lunch breaks, and after the kids go to bed. The core workouts are going to push you, but in a fraction of the time it takes to commute, attend a live class, and drive back home. Our beginner session (Water Series) starts at just 25 minutes – and even our most advanced and challenging sessions (Star Series) are under 45 minutes (half of many traditional yoga sessions). Every core workout in Nerd Fitness Yoga features a list of “progressions” or variations on the pose that can make it easier or more difficult depending on your body type and experience with yoga. This means that you’ll never have to stop midway through class and wonder how you should change or adapt a move you need to. We tell you in the video AND beside each session workout with pictures and text. In addition, we’ve populated all of our poses into one huge pose library you can access at any time. This gives you a basic idea about the difficulty of each pose variation, some basic background on it, and steps about how to make it easier or harder based on your needs. Our library covers every single pose we do in all of the 14 videos. As you get better, your workouts will get harder! Level Up! Whether you’ve never attended a single yoga class before or you are regularly looking for new ways to push your training, we’ve designed our workouts in a level-based manner so you can get started right away. Beginners will start with our “Getting Started” video and then onto one of our two unique Water Series workouts. These take between 25-30 minutes and serve as the place most people will start. Someone more experienced, or already familiar with yoga, will likely be able to jump ahead and into one of our two rotating Fire Series workouts. These are just a few minutes longer, but use tougher variations and poses as you build up. 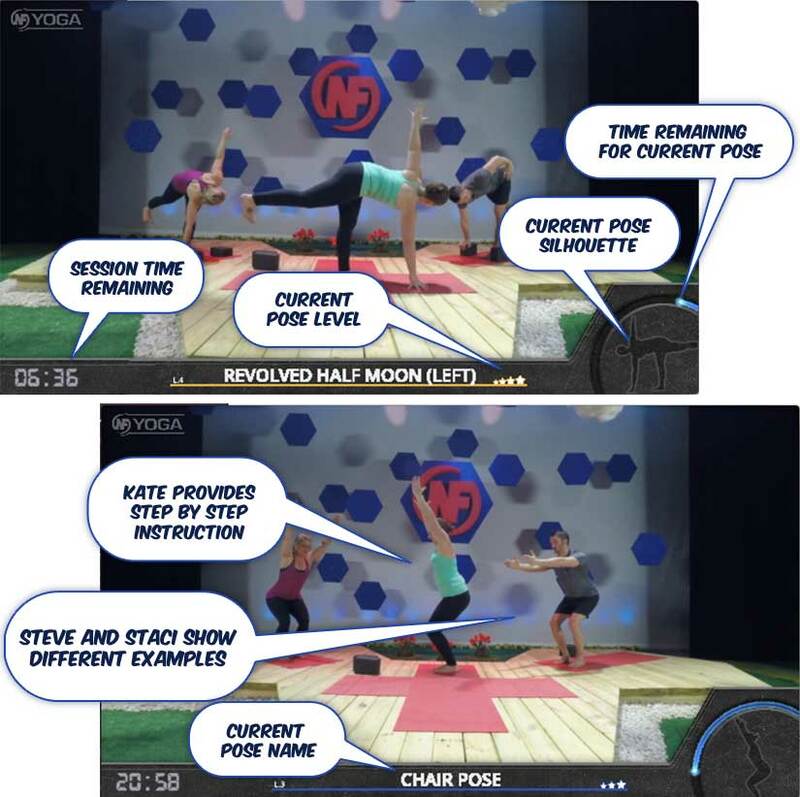 Finally, our unique Star Series workouts will push even the most fit and familiar yoga practitioners. We still keep them reasonable at under 45 minutes, but you’ll definitely sleep well at night after one of these. When you combine our level-based core workouts with the ability to scale any of the poses up or down with our suggestions, you can have dozens of uniquely challenging workouts that will scale right alongside your progress. Nerd Fitness Yoga is insanely easy…just click play and follow along! Get encouraged by a worldwide community of like-minded people. The Nerd Fitness Rebellion rocks. Our community members are some of the most passionate, generous, and motivating people you’ll ever meet. Getting healthy and leveling up your life can at times be a little lonely – but it doesn’t need to be. 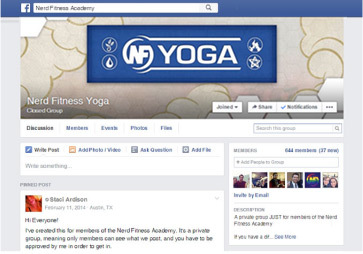 We’ve created a private Facebook group only for members who’ve joined Nerd Fitness Yoga. This is a perfect place to get support, encouragement, and accountability from thousands of your peers. It’s commonplace to share specific accomplishments, get specific feedback and perspective on challenges, and meet and form friendships with like-minded Rebels. You get instant, lifetime access to Nerd Fitness Yoga for one single payment. At $10-20 per session, attending in-person yoga sessions can get really expensive, really fast. That’s not counting gas, gear, and your extra time invested! Joining a monthly online yoga program isn’t much cheaper, as most range between $10 – $50 every single month. That’s hundreds of dollars over the course of a year. 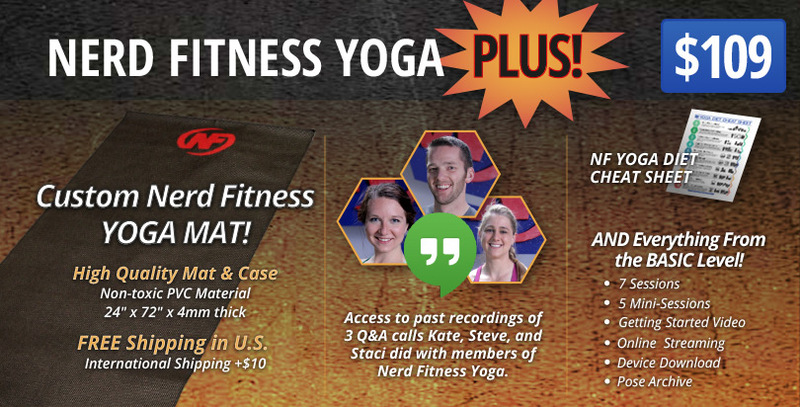 A single, one-time payment gets you full, instant access to Nerd Fitness Yoga. 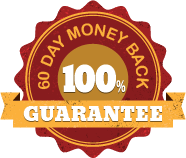 It also comes with a 60-day, 100% money back guarantee, so you can try the course out to see if it’s a good fit for you! NEW: 3-month Payment Plan for Yoga Basic available here for $29/month. I’m confident that if you follow the advice and regularly continue your yoga practice, you WILL level up your life. However, if for any reason you decide that Nerd Fitness Yoga isn’t for you, just let us know within 60 days, and we’ll give you a 100% refund. If you buy the Yoga Plus version of the product, simply mail back the yoga mat and we’ll take care of the full refund. Do I have to pay every month like a yoga membership? Absolutely not! For the BASIC and PLUS levels of Nerd Fitness Yoga you pay once and get immediate access to everything right away. Note: Our payment plan option (only for Basic level) is new, and let’s you break the cost of Yoga into 3 payments. Once you start your first payment (today) you get immediate, full access to everything. We never charge you after the 3rd payment and their is not ongoing cost or payments down the road. What is the difference between BASIC and PLUS packages? Both Basic and Plus levels get you full access to all core videos, all supplemental mini-sessions, the full pose library, and a bonus video. Nerd Fitness Plus however has even more. You get a high quality, custom Nerd Fitness yoga mat with carrying case and free domestic shipping (or super cheap international shipping). You also will get past recording of 3 Q&A hangouts Kate, Steve, and Staci did with previous members of Nerd Fitness Yoga. And finally you’ll get our Nerd Fitness Yoga Diet Cheat Sheet to print and post as a guide to continue to level up your eating habits! What if I buy and for some reason it’s not for me? We know you are going to love following along to the videos and starting your habit of yoga. However, if for any reason if you aren’t totally blown away, you can ask for a full refund any time in the first 60 days. No questions asked, we’ll get you refunded. If you ordered the PLUS package, we’ll ask you send back the mat to our warehouse. I’ve never done yoga before; am I going to be able to do the sessions? Absolutely! We’ve designed our level-based sessions and the scaling of our poses so that literally any experience level and body type can get started slowly and build up. 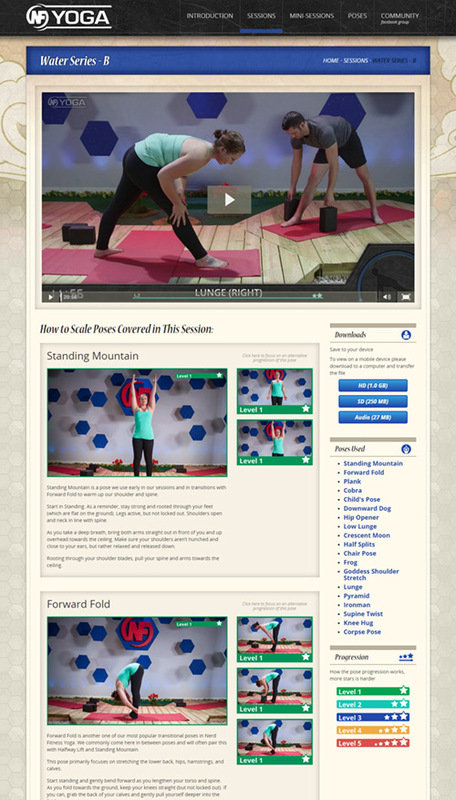 We also have a specific Getting Started video just for people who are brand new to yoga. I’m 200 pounds overweight / extremely weak / 50+ years old / injured… am I going to be able to do this? If you are in an extreme medical situation, you should always consult your doctor or physician before starting ANY type of exercise, stretching, or workout program. As long as you are healthy enough for light movement, we’ve designed our level-based sessions to start slow and work up in intensity as you get used to the movements. You can use our pose library (which appears under each video too) to learn how to scale even the most basic movements to work with your body type, strength, and experience. I’m already a huge yoga practitioner. I go to a studio 3-4 times a week. What about me? You’ll probably find our compact Fire and Star Series session worthwhile if you are looking for something you can do from your own home, office, or on-the-go. You can use the pose library and your existing knowledge to scale up even our easier workouts for more variety. Honestly though, if you already have a program that works for you (in person or monthly membership), good job. Keep at it and keep leveling up. Can I download the videos to my phone, tablet, computer, or other device? Yes. There are no device restrictions on our end. We’ll provide both HD (large files) and SD (smaller files for phones and tablets) downloads in .mp4 format. We’ve even included just the audio if you are on the run and can’t watch the videos for any reason. We believe yoga should be ready to go when you are, so we made it easy to take it with you (both streaming and downloading). Who is Kate Marolt, and is she a certified instructor? Kate is a long-time Nerd Fitness Rebel and active member of our community. Kate has had over 1000 hours of combined training in various yoga styles including vinyasa, hatha, anusara, and more, and have been teaching for 4.5 years including international yoga retreats. Kate’s style is a blend but mostly hatha style. Nerd Fitness Yoga is focused on properly aligning the body and breath for an integrated form of movement and stretching. 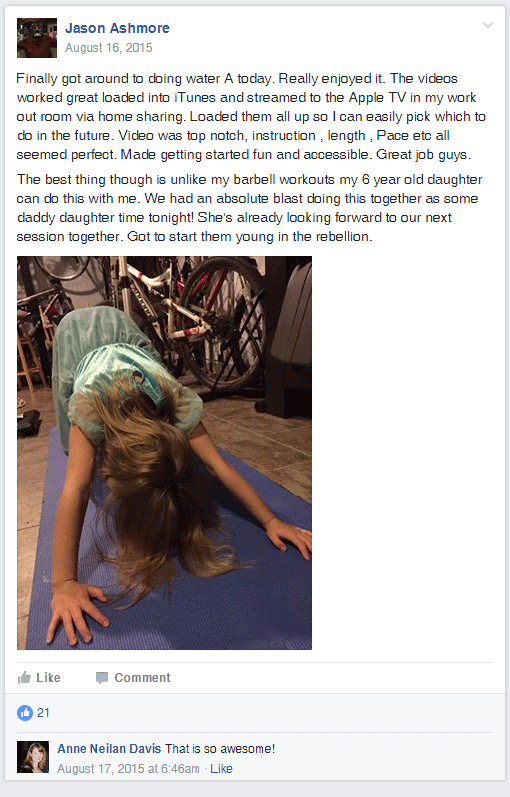 She’s also taught session live at Camp Nerd Fitness for two years now. She has an infectious positive attitude and true gift for introducing people of all experience level and body types to the practice of yoga. We are husband and wife, or roommates, or family in the same household… do we have to purchase multiple copies? If you want to, sure, we wouldn’t. If you live in the same household and want to do yoga together – we encourage that! Yoga can be even more fun with a friend or family member. Just purchase in one of your names and stream or watch the video routines together when you can. The email you use will be your primary login. How does shipping work? How much do I have to pay extra? If you live in the United States, you will pay absolutely nothing. Shipping is 100% free and included on the PLUS level. If you live anywhere in the world that isn’t the U.S., – shipping is a flat $10 for you. No matter where you are, it’s just $10. Can I order an extra yoga mat for my friend, spouse, child, or parent? Yes, we’ll allow you to order extra mats if you need them. First, complete a purchase of the PLUS level (which includes one mat). Afterwards you’ll get instructions for adding additional mats. We’re really proud of Nerd Fitness Yoga and we’d love for you to check it out! My goal with this course is to help you get started with yoga, have fun routines to follow anytime, anywhere, and give you the confidence to turn this activity into a habit. With a full 100% refund guarantee for 60 days, we’re confident that this is a great way to get started with yoga, improve your flexibility, and is a great compliment to following a strength training routine. We don’t sell a lot of things at Nerd Fitness, so when we do put a new product up for sale, you can be sure it’s been made with the highest standards that you’ve come to expect from my team and me. Here are those buttons again, just in case you missed them earlier! 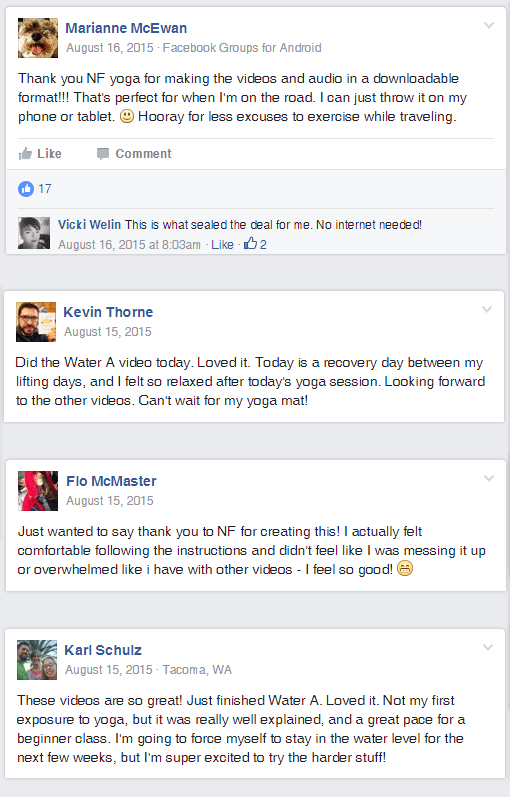 Level up your life with NF Yoga! 7 Session Videos, 5 Mini-Sessions and a BONUS Getting Started Video! Stream Online or Download the videos and the amazing Pose Archive! Click here for instant access Buy Yoga Basic! Custom Nerd Fitness YOGA MAT! Mailed directly to you for FREE! Access to all 3 Q&A calls with Kate, Steve and Staci, plus the NF Diet CHEAT SHEET! Click here for instant access Buy Yoga Plus!